Why have drive-in theaters decreased in popularity? How many drive-in theaters are there in the United States today? Have you ever been to a drive-in theater? There's nothing quite like watching a movie on a huge screen under the stars with a group of friends or family. Most drive-in movie theaters have at least one large outdoor screen. Some have several screens. People can watch movies from their vehicles, or they can sit outside in chairs or relax on blankets. Since it's hard to see a movie outside during the day, drive-in movies don't start until after dark. Most drive-in theaters show several movies each evening. Since the price of admission covers all the movies for the evening, drive-in theaters are a better deal than regular movie theaters. When drive-in theaters first started, the movie's sound came from large speakers near the screen. However, this made it difficult for people farther away from the screen to hear. Individual speakers that attached to vehicle windows were invented later. Unfortunately, they had bulky wires that were easily damaged, especially if someone forgot to take the speaker off the window before driving away! Today, movie sound is usually broadcast through radio signals so that the movie can be heard through vehicle speakers. Some people bring portable radios that let them carry the sound of the movie with them wherever they go. Drive-in theaters were very popular in the 1950s and early 1960s. At that time, there were almost 4,000 drive-in theaters in the United States. Drive-ins were popular with families who liked to snuggle together under a blanket to enjoy a movie outside. Drive-in theaters used many interesting ideas to increase business. Some drive-ins installed playgrounds, petting zoos and miniature golf courses for children. To entertain parents, some drive-ins would feature local actors or musical groups before shows. When televisions and video rentals became popular, though, drive-in theaters saw their business drop. They also suffered when many areas began to adopt Daylight Saving Time because they had one less hour of viewing time in the evenings. Today, there are less than 500 drive-in theaters in the United States. Many still enjoy steady business from loyal followers who love watching movies under the stars. If you don't have a drive-in theater near where you live, you might still be able to enjoy watching movies outside. Companies have invented inflatable movie screens that can be moved from one area to another to show movies in all sorts of outdoor settings. Want to enjoy your favorite movies in the great outdoors? Make your own homemade backyard movie theater! Even if you already have all the supplies you'll need, the experience will be more fun if you get the whole neighborhood involved. Do you know someone with a movie projector? 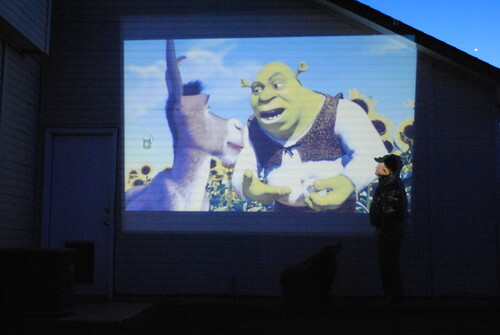 Maybe your neighbors have a portable projector that they use with a laptop computer on business trips? If not, you may be able to rent one from a local store. For a screen, you can use a portable projector screen like the ones often used for home movies. You might be able to rent one of these at a nearby store, too. Of course, a real screen isn't necessary. You can hang a plain white sheet or even use a light-colored blank wall instead. Add a couple of speakers, and all you'll need are some comfortable chairs, blankets, pillows and snacks! I love the idea of backyard movie screenings! The community we used to live in would do a monthly movie at the park. It was really fun sitting around with all of our neighbors, sipping hot chocolate (or other beverages) and watching a movie.